A stroll on North Carolina’s linear Mountains-to-Sea Trail usually requires a hike between cars parked at different trailheads or an out-and-back walk. Near Blowing Rock, it’s easy to avoid that on one of the MST’s few loop hikes. 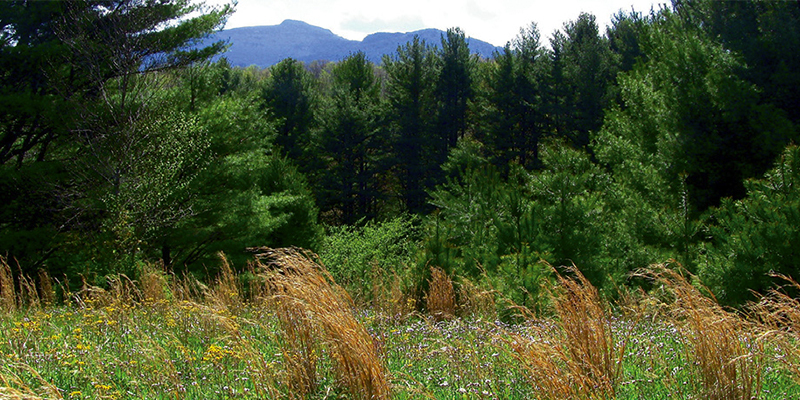 Near Grandfather Mountain, the MST parallels the Blue Ridge Parkway following a number of named paths, including the Tanawha and Boone Fork trails. Holloway Meadow Loop follows parts of both but circles back to form a circuit through breezy meadows. Navigate: Leave the parkway at the U.S. 221 exit, milepost 298.6. At the stop sign, turn right onto the dirt road and in one mile park on the left. Start on Holloway Mountain Road, an old dirt route south of Price Park that links the Parkway to NC 105 in Foscoe. From a roadside parking area, head north across the road on the Tanawha Trail, through a grassy field, then along rhododendron-lined historic roads. At a junction beside a meadow, at about 0.6 mile, head right into the field past the gnarled apple trees and boxwoods of an old homestead. After passing through some meadows, the trail dips into rhododendrons and white pines to cross two bridges. At 1.1 miles, go left at a junction with the Boone Fork Trail and you’re back in some fields, eyeing distant views. The Boone Fork Trail/MST veer off right at 1.5 miles, but keep straight under a tunnel of rhododendron. Exiting the rhodo, undulate left over grasslands. 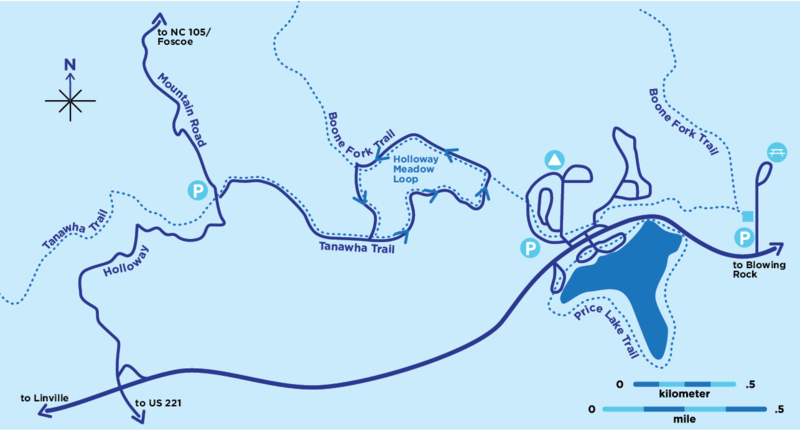 Where you rejoin the Tanawha Trail at 1.9 miles, turn right back to your car. Lauding this locale, Margaret Morley wrote in her 1913 book The Carolina Mountains, “There’s always a cool breeze in the high world at the back of the Grandfather.” Take a picnic, and leave the trail for airy views from many a hidden hilltop.